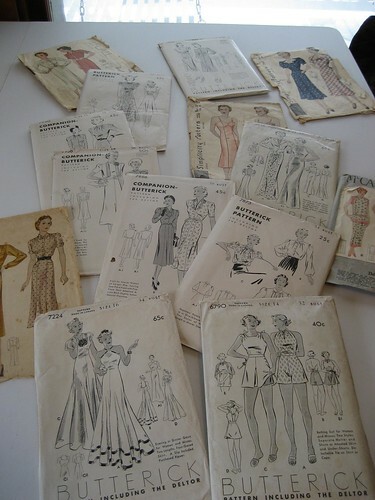 I love pretty much all vintage patterns, but I'm drawn mostly towards the '30s. Of course these are the hardest to find for a reasonable price anymore. Occasionally I'll come across a few at an antique store for a few bucks, though. I especially love the rare patterns like the sailor pants, bathing or 'play' suits and the evening gowns. I swiped the bathing suit pattern off of eBay a few years back. I was so pleased when I won that auction. I still haven't gotten around to making it up, but that's a project I'd like to tackle this year. Can you imagine how much fun it would be to swim in a bathing suit made of wool jersey?? I CAN! That evening gown to the left of the bathing suit pattern is kind of my pride and joy. I grabbed that baby off eBay around the same time I got the suit. (A lot of these patterns I got around the same time and from the same seller - if you couldn't tell...) I paid more than I wanted to pay for that pattern, but it was worth it. I've made it once and I just love the wide bias-cut skirt. It's tricky to cut (especially if you choose silk chiffon as your fabric!!) but sews up heavenly. I personally think the 1930s translates quite well to modern apparel. Sorry for the delay on posting my picture for the week. Some things came up today that were very unexpected. My dear friend was hit by a semi this morning and although I think she will be alright, as far as I know she's still in critical condition. I don't mean to end this post with a sad note, but would appreciate any prayers if you happen to think of it. She and I always like to dream up pretty vintage dresses to make and we both share a lot of the same passions. I do have faith that she'll get through this, if it's in God's plan. I'm praying for your friend, Anna.